Colorado band Page CXVI are well-known for breathing new life into wonderful old hymns. The band has just released Advent to Christmas, the first of three records based around the church calendar. To read my review of that album click here. I got to talk extensively with Page CXVI lead singer Latifah Phillips about the record, Christmas, and the best cooking techniques to make delicious homemade fried chicken. SAM: Latifah, where do we find you today? SAM: Is this your hometown? What’s it like? LATIFAH: It’s a small town. It has one little main road with a post office and a slew of little grocery stores. It’s got a library four blocks away. It’s a really small town in between Boulder and Denver. And Boulder’s kind of our biggest town and Denver’s our biggest city. And traditionally it was a mining town, so a lot of old miners lived here. So there’s all these tunnels that go underneath the town which is kind of an interesting fact. Y’know, Lafayette is just full of normal, happy-go-lucky people, and I really like it here. SAM: Well there’s good music coming out of Lafayette because you’re part of Page CXVI. Your album Advent to Christmas has just been released. Why did you decide to make a seasonal record like this? LATIFAH: Y’know, we have been asked for the last four years to Advent record specifically, and we had a lot of other projects – Hymns 1-4, Lullabies, and we had these other things we wanted to finish first. So when we thought about doing Advent… in the last couple of years I had been getting into liturgy and the church calendar, all the seasons. So Dann, Reid and I sat and talked about it and we said ‘Why just do Advent when we can walk all the way through Easter?’ So we decided to do three records. And the reason why is I really love the rhythms that celebrating these different seasons help create in our lives. Meditating on different parts of the gospel and who we are before God, what he’s done for us. And each season has a different kind of focus for meditation, which I found as I’d been writing and preparing for these records since last January, has been really giving me a lot of peace. And I think it’s because I’m not just focusing on one point of the gospel, but we’re going through the whole story of the gospel every year, together. So we just thought it would be really nice to do that to music. There’s a lot of materials and books out there that walk through the church calendar, but I haven’t seen a lot of records. And a lot of people do Advent and Christmas, which is wonderful, but I wanted to get us all the way through Easter. So that we could meditate on these different things not just with Scripture, not just with literature, but also with music. SAM: And these records have been funded by fans. Why take that approach? LATIFAH: Y’know, we’re a small independent band and in lieu of having a label, we knew from the scope of the project that we wanted to do we would just need a little more funding upfront. So we look at it more as a pre-order system. If you help invest in the record, we’ll slew different rewards that you get, that starts with getting the record. And it just feels like a really fun way to include fans in the process from the beginning. So they’re getting updates, they’re with us throughout the process, and it just feels a lot more like we’re doing it all together. As opposed to, when you’re an artist you can lock yourself in your studio and feel like you’re all on your own. And that’s just not how we love to live our lives in the band. The band believe in living in community and doing things together. So it felt a little more communal, and honestly it’s really helpful to know you have the budget to make the record really right. We were really thankful for everybody that partnered with us. SAM: There’s a real organic feel on this record as I listen to it. It seems like the words are what you really want people to focus on. How important is it to you that the gospel is communicated in your music? LATIFAH: I think the gospel is communicated, or can be communicated through everything we’re doing. The gospel isn’t just me telling you the gospel story. I think that we can live the gospel through how we treat each other, through the art we make, through the food we cook, through the way we hang out with people. So I think it’s really important to me in this sense that I’m always communicating the peace and the truth and the love and grace of Christ through the things that I’m doing. And the words of these songs are so rich and poetic and beautiful and paint this wonderful picture that automatically starts resonating with my soul. So we obviously spend a lot of time on the sound and the music and the melody and the instruments on the record, but unless it’s partnered with a wonderful lyric… That’s what helps to pull me all the way forward. So I would say it’s really important and… Did you feel like you really were able to hear lyrically what was happening in the song? Did it feel like it resonated with you? SAM: The first track, Awake My Soul, Awake My Tongue, why did you pick this one to start the record? LATIFAH: Well we wanted to start with Advent, because Advent takes us into Christmas. And Advent is a season – it means in Latin ‘coming’. So we’re preparing for the coming of Christ in two ways. Preparing or remembering, it’s waiting for a Saviour, for baby Jesus to be born. But in some ways we’re still also waiting for Christ to come back and so it’s applicable now as well as it was then. So Awake My Soul, Awake My Tongue I thought was a good way to read this at the beginning of the story of waiting for Christ to be born in his manger. Remembering that story. But then the chorus which we wrote with ‘awake my soul, awake my tongue’ is just reminding us: Christ is coming! This is something to live for. This is something that’s gonna give us life. I thought it was a good chorus, a good refrain to get our hearts in the right place as we begin to walk through Advent and Christmas together. SAM: Now Page CXVI was formed in order to make hymns accessible and known again. Why is this your mission as a band? LATIFAH: We first started as a band called The Autumn Film, and we’ve still made a couple of records under that moniker. We were always leading worship. And we were leading worship with no name, just because The Autumn Film – that’s not really what we were doing. All three of us had grown up listening to hymns and loved them, and when we started leading, for me it’s really the only songs I wanted to do. And it’s because the language, the message, the theology in hymns is so rich and so deep, that it automatically made me excited to create music that elevates the lyric as well. And the guys are really on board and into that idea too. So that’s what we started doing. And we did that for a couple of years, and then people started asking us, ‘Why aren’t you putting these on a record?’ We were finding these really worshipful and really encouraging. And I think there’s a handful of different people who have been doing it and interested in hymns, but for us we didn’t have hymns records that we listened to from our indie rock/pop background, y’know? We had the music that really matched what the lyric was doing. And so that’s why we felt compelled to create it. It wasn’t to become rich and famous or because we saw some hole in the market, it’s because we just had to make it – that’s the best way I can say it. And we just started realising as we were travelling and playing all over the country, that people were longing for these songs again. People were really excited to have these in worship. Because I think that hymns have stood the test of time over the past couple of hundred years people are still singing these songs because they ring so true. And there’s just not a lot of writers – there’s a few – but there’s not a lot of writers currently that are writing the way that the hymn writers wrote. So that’s why we thought it was important not to lose this rich part of our history as believers and as the church. But continue to bring them forward and further them to another generation of people. SAM: What is it that you love about hymns in particular? LATIFAH: I think it’s just the words. We don’t use the vernacular and vocabulary that they used then, you don’t use it very commonly today. But they did such a great job by choosing, in my opinion, amazing theologically rich, reverent words that weave this imagery in my mind. And for me it wove a melody into my brain, and that’s why we change a lot of things and do different things. But it’s definitely the language, hands down. SAM: Do you have a favourite hymn out of all the hymns you’ve done and all those that are out there? LATIFAH: Oh that’s such a hard question. That’s like… I don’t have kids yet but it’s probably like asking a parent who their favourite kid is. […] I think I would say right now, currently, my favourite hymn is a hymn that I rewrote with my friend Dave Wilton who works on our records with us – He’s a great artist – for [the forthcoming record] Maundy Thursday and it was a hymn called I Love the Lord. I found it buried and I – I always restructure the language a little bit and create choruses and that kind of stuff – but that hymn has just really hit me in a place right now in my life. It really speaks to God as a comforter and God as a shepherd. It has just really ministered to me, and so even though nobody else has it yet it’s coming out March. So it’s going to be for the second record in the project. SAM: Awesome – and actually, I was keen to know more about the plan for these church calendar records, because this is the first one – could you tell me about the plan for the releases and when they’re going to come out and what we can expect from those? LATIFAH: Yeah so… Lent to Maundy Thursday will come out the first day of lent – which I believe is March 4th – and then the third record will come out right before Good Friday. So that would be April 15th. So those will come out within a month of each other, but we wanted to release them with the season. That was the intention. So you can kinda start listening to the music as the season on the calendar begins. SAM: Wonderful. Are they recorded and ready to go? SAM: I’m looking forward to hearing them all! Comfort, Comfort, Now My People – perhaps a lesser-known hymn than some of the others. What should we listen out for on this track? LATIFAH: Oh man, this is such a good one. This is a really interesting song in the sense where we combined the old hymn Comfort, Comfort, Now My People, with the actual song that it comes from. And I think what I love about this song is it discusses the idea that we can – and there’s been debate about this so I’m not trying to make it more of a problem – but that we can experience God’s kingdom now, in the way that we communicate the gospel to each other, and the way we can appreciate the blessings that he’s given now on earth, but we know that God’s full kingdom isn’t here now. I believe there’s parts of God’s kingdom that we can be experiencing currently as believers and on earth today. So that’s what I love about this song, that it kind of talks about that. And that brings me comfort – to know that there’s pieces of God’s kingdom that we’re experiencing now currently. It’s not just about waiting till we die, y’know? And so that’s what I’d listen for. SAM: Latifah, I’ve been following you on Twitter, and I want to quote one of your tweets from the other day. It said ‘Comping my vocals all day makes me hungry for homemade fried chicken’. Are you a fan of homemade fried chicken? LATIFAH: Who’s not a fan of homemade fried chicken? [Laughs] It’s delicious! SAM: I’ve never made homemade fried chicken! I don’t know how to do it! LATIFAH: You’ve never made it? Well the good news is you have the Internet and you can Google how to make it! LATIFAH: [Laughs] Well I think that homemade fried chicken is better than you can get anywhere else – and look for recipes that involve soaking it in buttermilk. SAM: Oh buttermilk? Is that the secret? LATIFAH: I tend to think it makes the best batter which makes the best fried goodness on the chicken. And then, it’s a little trickier at home because it involves really hot oil – so be careful. SAM: Well back to the music, earlier this year you put up your band and the Autumn Film’s back catalogue online for free download. Why did you guys decide to do that? LATIFAH: Y’know, we had been a band at that point for seven years. And it felt to Reid, Dann and I, we wanted to say thank you for all the people that have been with us along our journey and then also something to continue to spread the word – the idea of these hymns is not to keep them to ourselves, we want as many people to have access to them as possible. And so giving away around eleven records minus about eleven songs we couldn’t include because of copyright stuff, giving them away for free for a month, a lot of people think it’s kinda crazy because they think that’s a lot of money you won’t be making but – the idea was to say thank you and to have a gift for people to have and receive. And it was amazing – we had over 250,000 albums downloaded. Which shocked me! I had no idea. And what was really special was that people were still buying the records on iTunes! Which I couldn’t believe. [Laughs] But thank you for those of you that did that! But it was also to catch people up for those who only had one or two of our records if they wanted access to the rest, then they could have it. I’m sure there’ll be more giveaways in the future, but it was a really fun way to honour the seven years of being together. SAM: Christmas carols and hymns – there’s so many out there – how do you go about selecting a shortlist to seven tracks? LATIFAH: It’s arduous. I started researching it last January and I probably ended up reading through probably a thousand hymns for the whole thing. And you know, at least a third of those were Christmas/Advent. And then basically what I do is read. I just read. I read through the lyrics and then if they compel me immediately I put them in the shortlist. And I had gotten it down to about 111 or so songs for the 21 that we were going to do. And then I read through them again, and I sit down at the piano. And if something immediately kinda happens, like a little melody idea or maybe it’s just a piano line, or a chorus comes into my mind – then that goes in another sub-category. It’s moving me melodically. But like Silent Night – I had envisioned for that song for years and it was so fun because I grew up playing cello, that kid in the orchestra pit, and so I grew up with all these wonderful string instruments around me so it was really fun to create some really beautiful orchestral moments in the music. Silent Night is one of those songs where I just sat down and literally the vision in my head is what happened on the song in the end. And it was really exciting to see it come to life. So it’s kinda like that – you just have a vision for the song, and you put it in a category, and it’s working – then it ends up on the record. And there were a handful that we couldn’t fit in but I’m really happy with what we ended up with. SAM: I should ask you too, what do you love about Christmas the most? LATIFAH: Oh! Golly – ummm… Well outside of all the really wonderful things about good time with family and friends, eating delicious meals together – that’s my favourite thing! Eating good food with my favourite people who I love. LATIFAH: Yeah you know it! I would have fried chicken on Christmas if it was like – not everybody else wanted turkey or ham or whatever we’re supposed to have… But I think for me it’s just the reminder of God’s fulfilment of his promises and his provision. I think that I’m never gonna stop needing the reminder that he fulfils his promises. I think like most people, I just struggle with doubt. ‘God, where are you? Are you going to show up here, or what’s next? How am I going to move forward in this? Where do I find you?’ And Christmas and Advent for me has just been a really special reminder that God loved us so much. That he fulfilled his promise of a Saviour. And I think that’s my favourite thing, more than anything else. SAM: Angels We Have Heard On High – is there anything we should listen out for as we hear this song? LATIFAH: I had a lot of fun with this one. This is probably – in my opinion – besides Silent Night, that ended up closer to the original melody and idea. So this is probably the most Christmassy song – we had jingle bells on it – all that kind of stuff. There is a line in the song that I had never focussed on before. It’s ‘While our hearts in love we raise’. I love that sentiment. So I ended up kinda repeating it and then repeating it through the whole end of the song. I think that’s my favourite part. It’s really just meditating on the lyric and that concept of praising God through the love and gratitude that pours out of our hearts. That’s what I’d listen to. SAM: Is there a key message or big idea to Advent to Christmas? SAM: What do you hope this record and the two that will follow it will do? LATIFAH: Honestly my hope is that it will just bring encouragement. And comfort. That it will comfort the afflicted in all the right ways. I mean, that’s why we make the music we make. That it encourages, that it literally brings courage to those who listen to it. And whether that’s someone who’s going through a hard time and just enjoys listening to music… Because we have some good melancholy parts in our music that helps them feel less alone, less isolated. But also turns them to what’s really going to bring them peace and comfort. I think that that’s what I really love. For people to receive the same kind of peace that I’ve got through just meditating on these songs and going through all the seasons over the last year. SAM: Do you think there’s any chance that one day you might come and play these great records in Australia? SAM: You could have surfed your way to Australia! LATIFAH: Exactly! But it would be one of my greatest joys to come over and we have a pretty big fan base in Australia and I’d really love to come out. So keep your fingers crossed! SAM: The song Silent Night closes the record. It’s beautiful and dreamy in the way that it’s been arranged. What does this song mean to you – this great carol? LATIFAH: I grew up going to church and it was a song you sang at midnight on Christmas Eve when everyone lifted their candles. As a little girl I remember thinking ‘Cool I get to play with fire!’ Fire seemed to be the best part of it. [Laughs] As I get older, I really like the idea of God speaking through the stillness. And God – there’s that great – I think it was Elijah. He was in that mountain, and God didn’t speak through the wind or the storms or the crazy stuff – but he spoke through the whisper, the small gentle breeze. I think it’s just really neat the idea of Christ coming into the world on a really quiet night in a barn. It’s just so the opposite of what you would think. I love how God does that. So I love this story, in Silent Night. And I love at the end – there’s a fourth verse that a lot of people don’t sing. And that’s where I got that ‘Hallelujah to our King, for Christ the Saviour is born’. And when I was reading through it I was like – ‘Oh man! How come we don’t get there, and stay there for a while?’ So that’s why we get it on this song, because that’s the point. Hallelujah! Christ is here! He’s born! This is kinda exciting, people! I think that’s why we had that song swell and get big and dreamy, because that’s what it is. Big and dreamy. I think that’s my favourite song on the record. SAM: Why did you pick this one to close the record? LATIFAH: It just felt like a really great bookend, in the sense that Christ is here, he’s born, it’s the fulfilment of God’s promise, and let’s have gratitude and thankfulness and say hallelujah. It just felt like the right way to go out. SAM: Well all the best for this release. It’s really been great to listen to it and we might try and talk to you when the next two come out and get the story behind them. Thanks so much Latifah! LATIFAH: I would love that. Let’s make sure it happens. Thanks Sam! 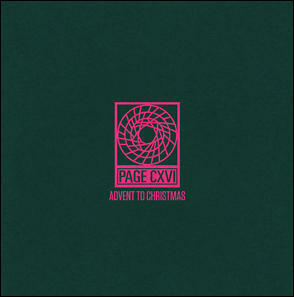 Advent to Christmas by Page CXVI is available now at pagecxvi.com and on iTunes.